Fieldcrest third graders scattered around the classroom as they worked on their latest University of Illinois Marshall-Putnam Ag in the Classroom activity. Armed with a variety of resources and working in teams, their job was to decipher clues provided for the Three Little Pigs Escape Box. In this activity, the three little pigs lived safely in a comfortable pig barn. Big Bad Wolf had just been apprehended by the local police and locked in jail. If he would learn how beneficial pigs are he could earn a “Get Out of Jail Free” ticket. This educational activity had the students pooling their creative thoughts as they set out to help B.B. Wolf. Along the way they learned about the pork industry and many of the pork byproducts that make our lives better. 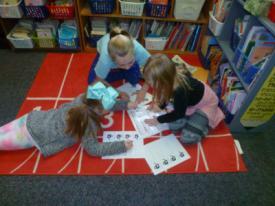 Students practiced searching for answers in supplied materials, math and reading skills and group collaboration. They worked through four Jail Gate Locks and were able to open the Escape Box just in time. Inside they found the ticket that gave B.B. Wolf a second chance and enough pig erasers for everyone. Resources were provided by Illinois Ag in the Classroom and Illinois Pork Producers. “Escape boxes are a great way to give students the opportunity to creatively solve problems with a team effort,“ stated Marshall Putnam Extension Ag in the Classroom coordinator, Julie Read. “Each member of the team brings something to contribute.” For more information call University of Illinois Extension – Bureau, LaSalle, Marshall, Putnam Unit Office at 309-364-2356. Extension offices are located in Princeton, Ottawa, Henry and in Oglesby on the IVCC campus.